We went to the dogs in 2010. And it had to be a Siberian Husky. Nothing else. At first, we contacted Nordic dog rescue organisations, but we never got anywhere close to an adoption, because either the dogs were chasing cats (and our tom Jakob was and is privileged for already being with us for years) or we did not agree about the course of action. 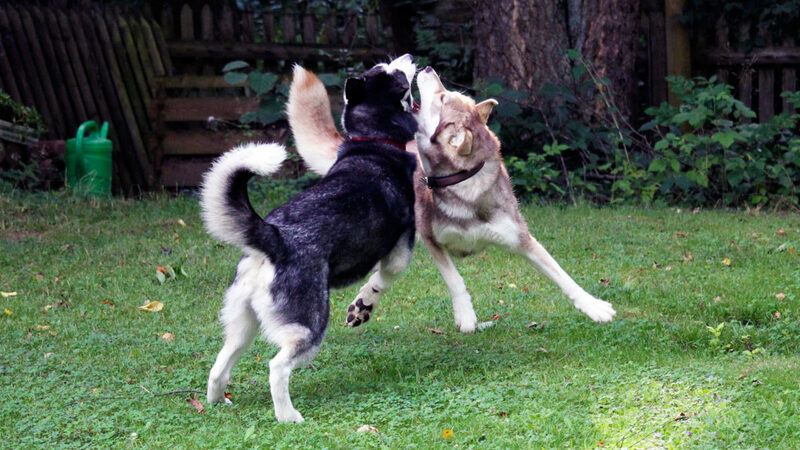 In the end, we started looking for a reputable breeder, and then met Sylvia Gusinde (Zausel’s Siberian Huskies). Sylvia entrusted us with a girl from her litter J of 2010 (Ziemabora’s Yippie-Ki-Yay! x Zausel’s U Don’t Catch Me), Zausel’s Joy Division, whom we called Maggie. Maggie was an utterly beautiful and headstrong princess who turned our life upside down quite a bit. She looked just gorgeous and was well aware of people getting ecstatic in her presence. Sadly she died prematurely, when she was hardly four years old. After Maggie had passed, I volonteered walking dogs at the local animal shelter – and there he was, a huge three and a half year old Alaskan Husky, a dog from a broken home. Actually, we did not feel fit for a new dog yet, but his calm and confident nature swept us off our feet and eased the pain in our hearts. Now we were ready for another pup. And of course, it had to be from the Zausel’s kennel. On All Saints’ Day 2014 Zausel’s Red Rose moved in with us, beloved Kira. With her, I entered my first dog show, and if she hadn’t won her class, I certainly would not have continued showing her. But since this blithesome and gentle girl was rated as “very promising” and “excellent” several times, we started to talk about plans to carry forward those wonderful qualities with fitting sires. Hence we went through all the procedures to be allowed to breed according to the breeding rules and regulations of the DCNH and to use a kennel name protected by the FCI.